What follows is a record of a student’s observations from kišiinkwia kiilhswa (July/August 2009) to cecaahkwa kiilhswa (April/May 2010). Each student was asked to observe one feature (plant, tree, animal, celestial body, or weather phenomena) and its connections to other features. In addition each student was asked to visually represent these connections by constructing a visual web. In reviewing my notes, pictures and memories of ahsenaamiši since the beginning of the semester, I now see many connections as well as a uniqueness that is only found in this tree. Although, the majority of my observations are based on what I am visually interpreting, it is also evident that there is much more at work than meets the eye. In looking at the other points of ecological interaction and connecting them with ahsenaamiši, it becomes obvious that there are many more factors at work on this tree that takes residence on the campus of Miami University. The first connection that I noticed playing an integral part in creating a change in ahsenaamiši was that of kiilhswa. Although, I was not watching kiilhswa directly, I did notice its effect on ahsenaamiši . In watching kiilhswa, it seems that it touched different parts of ahsenaamiši as the summer came to an end and fall began. As the days shortened, it was interesting to see the change in color in the leaves based on where kiilhswa had been touching most directly. As kiilhswa spent more time in the southern sky and was setting much earlier, the leaves became very bright on the southern most parts of ahsenaamiši . This began as just a speck of color as only a few leaves began their change. There were many other ecological features that contributed as well. The second connection that I noticed was that of the other trees that were surrounding ahsenaamiši . Because of the close proximity of several other trees such as waawiipinkwaahkatwi, the ahsenaamiši was slower to change due to the indirect sunlight in those areas of shade. This caused ahsenaamiši to change color and begin its winterizing process in different stages across the tree. The third ecological connection that I saw was that of ciinkwia. Although this is a sign of the coming of spring, this was also the ushering of fall. With the thunder and rain, ahsenaamiši began to transform with immediacy. It was with this major rain and thunder that the majority of leaves completed their change and began to fall from ahsenaamiši . The heavy drops of rain and wind taking the leaves with efficiency. The fourth ecological connection seems to be the one that is having a bit of difficulty in this process. Teekwahkahki seems to be a bit late this year. We have had several light instances but nothing major as of yet. This seems to have caused many things to not change as immediately as I would have expected. The leaves on ahsenaamiši seemed to hang on much longer. In fact, many of the small connectors between the leaves and the branch remain on ahsenaamiši although the leaves are now long gone. This would make me believe that because of the lack of a severe teekwahkahki, the ahsenaamiši hasn’t fully withdrawn its nutrients to the branches and some life remains at the outermost branches. Teekwahkahki shows a similar connection with tapaahsia (Canadian Geese) and pyaakimišaahkwi (Persimmon) as it did with ahsenaamiši . It seems that tapaahsia doesn’t know to fly south. I believe that because of the light teekwahkahki, tapaahsia has no reason to worry about siipiiwi becoming frozen and uninhabitable. It is also interesting that the pyaakimišaahki on campus did not let go of its fruit. This seems very similar to what occurred with ahsenaamiši not wanting to let go of leaves. It is amazing to me how different the landscape is becoming for me. I catch myself looking around wondering if what I’m looking at is a waawiipinkwaahkatwi or a mihšiinkweemiši. I am beginning to differentiate between my surroundings and in doing so become aware of the many relationships that are present too. In trying to answer your query regarding the disruption of ecological points of contact or even complete disappearances of these, I have only a small frame of reference in which to reply. In guessing, based on a semester’s worth of observation, I surmise that the answer is both easy and visible to all and extremely difficult and hidden by years of hardship and struggle. By educating our community on the importance of ecological awareness we can find answers from the many that spread throughout North America. If the elk are no longer present in the east, maybe someone who is eager to learn and share can find them elsewhere and relate the coming and going for the whole community. Thus returning much of the importance of mihšiiwia kiilhswa (elk moon). If long observations and sharing of information lead us to believe that certain points of observation, like the late teehkwahkahki, are long term, then we might consider a change in the seasonal calendar to reflect that. By the use of such tools as the Internet, information can spread to the far reaches of the world, filling in gaps to those of us that may not be in a spot to go out the front door and touch and see these points of ecological importance. But in this lies the real struggle. When Trowbridge and several others described the way in which our community functioned in the 1820s, it is painfully obvious that we are starting anew in this voyage. When I sat at that bench for the first day of classes I was amazed at the faces of fellow Miami that I had never seen before. As the months went by, we played games together and shared our observations as a whole. The faces that I now see are familiar. I don’t know if this is what a community is supposed to look like, but it feels like we are part of something again. Maybe this is a new starting point or just a bit of a nudge to pay attention. Either way, the old adage, “No single raindrop believes it is the cause of the flood”, comes to mind. Now what was that word? Peetilaanki! 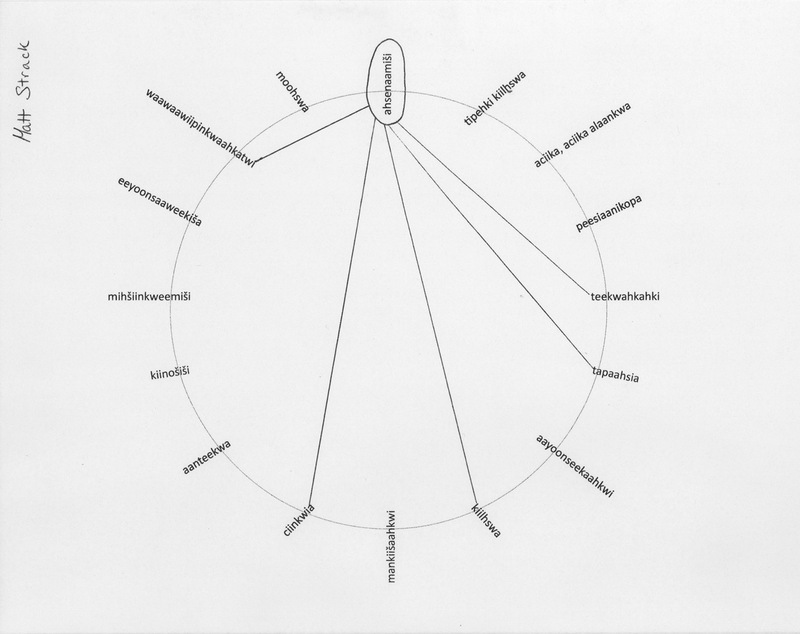 Click here to see the group web created by all the students as well as the translations for all of the words on the circle. All pipoonwi, ahsenaamiši did not move. Ahsenaamiši interacted during pipoonwi with much less sun. Periodically there would be a oonsaanikwa nearby. Mostly ahsenaamiši looks like a giant weirdly shaped ahseni during pipoonwi. Also there was a constant interaction with teekwahkahki during pipoonwi but this only became evident when miloohkami arrived. At the waawiyiisita of mahkoonsa kiilhswa there was a breaking. I would say that this was the first time that there wasn’t a complete or heavy teekwahkahki the night before. Immediately there were very small indications that ahsenaamiši had begun to wake and move. Very small growth was noted on the branches. No buds were present on the tree but there was an elongating of the branch. During that week, although not much growth was visible, we went to Houston Woods State Park for siihsipaahkwi (Maple Sugaring). At nepale neepiki of mahkoona kiihswa the long pedicled flowers started to sprout. Through my observations, I have seen that ahsenaamiši (Sugar Maple) is strongly connected to tipehki kiilhswa (Moon), kiilhswa (Sun), teekwahkahki (frost light, hard and last), aanteekwa (Crow), ciinkwia (thunderstorms) and niila (me). The first indication of change and connection that I observed this spring was between tipehki kiilhswa (Moon) and ahsenaamiši (Sugar Maple). At waawiyiisita (full moon) of mahkoonsa kiilhswa (young bear moon / 1st week of March) I felt that a bit of miloohkami (spring) broke through the solid ice of pipoonwi (winter). I believe that this Spring breaking was directly connected with a shift in position by kiihswa (sun). During that first week of March I saw that kiihswa (sun) was rising a bit more to the North. With the rising of kiihswa (sun) to the North, we would have more sunlight and longer days which would lead to more warmth. With the rising temperature, there was an immediate response by teekwahkahki (frost). With the lack of a teekwahkahki (hard frost) there was a dynamic change in ahsenaamiši . It seemed as if the buds of ahsenaamiši were waiting for that exact moment as they emerged fairly soon after the first day without a teekwahkahki (hard frost). Aanteekwa became more visible during the weeks after the breaking. First as individuals and eventually as small groups or flocks. During this time, change in ahsenaamiši became even more apparent as siihsipaahkwi (maple tree tapping) started to take place. With only one ciinkwia there was a complete change in ahsenaamiši as the long pedicled flowers and the beginning of leaves took shape on the branches. It seemed that the buds only needed a few drops of rain to begin producing the green covering that is a sure sign of spring. Most of all, the connection between all of the ecological features and Niila was made apparent with the coming of miloohkami. If I had missed the connections again, as I had for the previous 33 years, there would have been no impact to ahsenaamiši, tipehki kiilhswa, kiilhswa, teekwahkahki, aanteekwa, or ciinkwia. But, with my observations I am now aware of the importance of keeping watch over these points of reference. Without the information from all of these indicators, those who wanted to harvest maple syrup might miss a very important and narrow window. If this syrup was important as a food source there could be devastating consequences for not paying attention to the many signs that are available to all of us. And most importantly, for those of us who love a bit of maple syrup on our pancakes, I now can tell you how and when to harvest the sweetest stuff.